We assure you it’s not for sale because the Brooklyn Bridge is priceless. At Skyline Cruises, we know this to be true because we pass under this iconic New York City landmark on many of our NYC Dinner cruises. It’s one of the most recognizable sights in the world, but do you know the incredible history behind the bridge that spans between the boroughs of Manhattan and Brooklyn? You can do a full ship charter of the Skyline Princess, or if you’re looking to plan a smaller event, you can charter a private deck on one of our dinner cruises. We work with groups of all sizes and budgets of all types. A Skyline Cruise is perfect for any occasion. 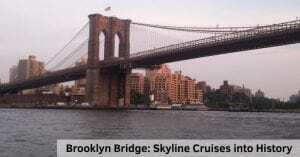 The Brooklyn Bridge has spanned the East River since it opened in 1883. But it took 14 years to get it there. Construction began in 1869 using a design from German-born architect John Augustus Roebling, according to the History Channel website. Roebling had built several suspension bridges including one that spans the Ohio River from Cincinnati to Kentucky, that still stands today. But just before construction began, John Roebling was fatally injured while taking final compass readings and his son Washington Roebling took over the project, which involved the dangerous work of excavating the riverbed in large wooden boxes called caissons. Many of the workers began to become sick with a mysterious ailment that was called “caisson disease”, that we now know is decompression disease, commonly known as “the bends.” It took a few more years for early 20th century scientists to realize that bringing airlocks up to the river’s surface protected the workers. Unfortunately, one of the people sickened by the decompression disease, was Washington Roebling himself. He remained paralyzed for the rest of his life, but he did not completely abandon the project. He observed the work for 13 years, watching through a telescope from his apartment overlooking the East River. But the de facto chief engineer of the product was Washington Roebling’s wife Emily. She oversaw the design, construction and the business aspects of the project. The bridge opened officially on May 24,1883 at a ceremony attended by President Chester A. Arthur as well as New York’s Governor and future president Grover Cleveland. But the honor of the first ride, was given to Emily Roebling. She took a carriage ride across the span while carrying a rooster which is symbolic of victory. A century later, our nation’s president Ronald Reagan was on hand to celebrate the 100th anniversary of the bridge. Every cruise is a celebration when you “Sail this Summer with Skyline.” All of our public NYC Lunch, Brunch and Dinner Cruises sail from the Worlds Fair Marina in Queens. Our private full ship yacht charters sail from many ports in New York, Long Island, New Jersey, Westchester and Connecticut. Contact us today.